Air Pollution Has an Effect On Sperm? Author SimaPublished on November 21, 2017 November 22, 2017 Leave a comment on Air Pollution Has an Effect On Sperm? Air pollution is linked to so many negative health effects, now another one - poorer quality sperm. In this study 6475 males (ages ranged from 15–49 years) had their sperm analyzed as part of a standard medical examination program in Taiwan. They were also able to get air pollution measurements for each person's address for that time period. They found that both short-term and long-term exposure to higher levels of fine particulate matter (PM2.5) pollution were linked to lower numbers of sperm being normal in size and shape (sperm morphology), but with a higher concentration of sperm. Perhaps a compensatory phenomenon? Air pollution, particularly levels of fine particulate matter (PM2.5), is associated with poorer quality sperm, suggests research published online in Occupational & Environmental Medicine. Although the size of the effect is relatively small in clinical terms, given how widespread air pollution is, this might spell infertility for a "significant number of couples," say the researchers. 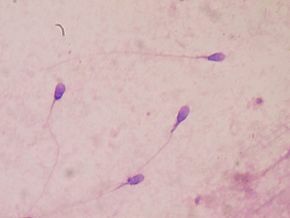 Environmental exposure to chemicals is thought to be a potential factor in worsening sperm quality, but the jury is still out on whether air pollution might also have a role. To explore this possibility further, the international team of researchers looked at the impact on health of short and long term exposure to fine particulate matter (PM2.5) among nearly 6500 15 to 49 year old men in Taiwan. The men were all taking part in a standard medical examination programme between 2001 and 2014, during which their sperm quality was assessed (total numbers, shape/size, movement) as set out by World Health Organization guidelines. PM2.5 levels were estimated for each man's home address for a period of three months, as that is how long it takes for sperm to be generated, and for an average of 2 years, using a new mathematical approach combined with NASA satellite data. Published on November 21, 2017 November 22, 2017 Categories healthy livingTags air pollution, fine particulate matter (PM2.5), spermLeave a comment on Air Pollution Has an Effect On Sperm? A study of 60 million Americans 65 years old and older (the entire Medicare population) found that long-term exposure to airborne fine particulate matter (PM2.5) and ozone at concentrations below current national standards increases the risk of premature death ("all cause mortality") even when the levels are below current national standards. This effect was most pronounced among racial minorities and people with low income. The national standards are called National Ambient Air Quality Standards (NAAQS), and they are established by the U.S. Environmental Protection Agency (EPA). Note that PM2.5 refers to fine particles in the air smaller than 2.5 micrometers - these are truly small particles. It is thought that these tiny particles contribute to the development of potentially fatal diseases various ways - by causing chronic inflammation, and also because they slip past the body's defenses and can be absorbed deep into the lungs and bloodstream. They are not sneezed or coughed out the way larger natural particles (like airborne soil and sand) are removed from the body's airways. The Harvard T.H. Chan School of Public Health researchers found that men, blacks, and low-income populations had higher risk estimates from PM2.5 exposure compared with the national average, with blacks having mortality risks three times higher than the national average. The results showed that if the level of PM2.5 could be lowered by just 1 microgram per cubic meter (ug/m3) nationwide, about 12,000 lives could be saved every year. Similarly, if the level of ozone could be lowered by just 1 part per billion (ppb) nationwide, about 1,900 lives would be saved each year. Another study finding a link between air pollution and negative health effects - this time a higher incidence of decline in cognitive functioning and dementia in older women (65 and older) exposed to fine particles (PM2.5 ). These extremely small particles from vehicle emissions are a major source of urban air pollution throughout the world. These results match other studies finding a link with urban air pollution, especially vehicle traffic, to negative effects on the brain (dementia, cognitive decline, shrinking of the brain, etc.). The researchers also exposed mice to this air pollution for 15 weeks and then studied their brains for evidence of degenerative effects in their brains - and yes, they did find them. Tiny air pollution particles—the type that mainly comes from power plants and automobiles—may greatly increase the chance of dementia, including Alzheimer's disease, according to USC-led research. Scientists and engineers found that older women who live in places with fine particulate matter exceeding the U.S. Environmental Protection Agency's standard are 81 percent more at risk for global cognitive decline and 92 percent more likely to develop dementia, including Alzheimer's. If their findings hold up in the general population, air pollution could be responsible for about 21 percent of dementia cases, according to the study. "Microscopic particles generated by fossil fuels get into our body directly through the nose into the brain," said University Professor Caleb Finch at the USC Leonard Davis School of Gerontology and co-senior author of the study. "Cells in the brain treat these particles as invaders and react with inflammatory responses, which over the course of time, appear to exacerbate and promote Alzheimer's disease. The adverse effects were stronger in women who had the APOE4 gene, a genetic variation that increases the risk for Alzheimer's. "Our study .....provides the inaugural scientific evidence of a critical Alzheimer's risk gene possibly interacting with air particles to accelerate brain aging," said Jiu-Chiuan Chen, co-senior author of the study....[Their study] adds to an emerging body of research from around the world that links air pollution to dementia. The offending pollutants—known as PM2.5—are fine, inhalable particles with diameters 2.5 micrometers or smaller. A human hair is about 70 micrometers in diameter, making it 30 times larger than the largest PM2.5. The researchers analyzed data of 3,647 65- to 79-year-old women from the Women's Health Initiative Memory Study (WHIMS). These women lived across 48 states and did not have dementia when they enrolled. USC scientists chronically exposed female mice carrying the APOE4 gene to nano-sized air pollution for 15 weeks. Compared to the control group, mice predisposed to Alzheimer's disease accumulated as much as 60 percent more amyloid plaque, the toxic clusters of protein fragments that further the progression of Alzheimer's. Study after study finds negative health effects from air pollution, such as heart disease (here, here, and here). Now two more studies found that living in areas with high air pollution is linked to a higher stroke risk. One study (done in Japan) found an increase of ischemic stroke on the same day as exposure to high levels of air pollution, while the other (done in London, UK) found a higher risk of death after stroke (especially ischemic strokes) in patients who live in areas of high air pollution. This was especially pronounced with exposure to smaller or fine particulate matter (PM2.5)- which is found in high quantities in vehicle exhaust fumes. More evidence showing that living in areas with high levels of air pollution is linked to a higher stroke risk has come from two new studies. Both studies are published online in the journal Stroke. The first, from the United Kingdom, shows a higher risk for death after a stroke in patients who live in areas of high air pollution, and the other, a Japanese study, suggests a higher risk for a new stroke the same day as exposure to high levels of air pollution. "We have shown a significantly increased risk of death after stroke in patients who had long-term exposure to high levels air pollution before their stroke occurred," senior author of the UK study, Charles Wolfe, MD.... "This was particularly pronounced for high exposure to smaller particulate matter — particles below 2.5 μm in diameter (PM2.5) — which are found in high quantities in exhaust fumes." For the study, Professor Wolfe and colleagues analyzed data from the South London Stroke Register, a population-based register covering an urban, multiethnic population.....Results showed an increased risk for death up to 5 years after stroke in patients living in areas of high air pollution. "While this study adds to the evidence linking air pollution to cardiovascular disease, it cannot prove causality as it has an observational design," Professor Wolfe commented...."So it is difficult to say for certain that it is the air pollution that is responsible but there are many studies now that have shown similar associations," he said. He noted that the smaller particles (PM2.5) were associated with a worse effect on mortality and this correlated with biological studies that have shown a greater inflammatory effect of small particulate matter vs larger particulate matter on the vessel wall. "Our study suggests that people who have previously had an ischemic stroke, but not a hemorrhagic stroke, may be more vulnerable and at a higher risk of death to chronic, long-term exposure of PM," they conclude. The Japanese study, by lead author Ryu Matsuo, MD, PhD, Department of Health Care Administration and Management Graduate School of Medical Sciences, Kyushu University, Fukuoka, Japan, and colleagues, looked at acute exposure to air pollution and shows a small increase in the risk of having a stroke within a day of high exposure to pollution. For the study, the researchers analyzed data on 6885 ischemic stroke patients from a multicenter hospital-based stroke registry in Japan who were previously independent and hospitalized within 24 hours of stroke onset. Professor Wolfe said his group have conducted a similar study looking at exposure of air pollution in the year before stroke, which showed a 23% increase in stroke risk in those exposed to higher levels of PM2.5. Millions of Deaths Annually Due to Air Pollution? Author SimaPublished on September 23, 2015 March 29, 2018 Leave a comment on Millions of Deaths Annually Due to Air Pollution? A recent post (Air Pollution Can Kill You) discussed recent research that found that air pollution is linked to an overall increase in death rates, especially cardiovascular disease. But how many deaths each year are linked to air pollution? Recent research suggests that outdoor air pollution, mostly by fine particulate matter with a diameter smaller than 2.5 micrometers (PM2.5), leads to 3.3 million premature deaths per year worldwide, predominantly in Asia. The number one cause worldwide is residential energy use such as heating and cooking, (India ,China, and the developing world). Outdoor air pollution leads to more than 3 million premature deaths per year, primarily in Asia, according to a letter published online Sept. 16 in Nature. Johannes Lelieveld, Ph.D., from the Max Planck Institute for Chemistry in Germany, and colleagues used a global atmospheric chemistry model to investigate the link between premature mortality and seven emission source categories in urban and rural environments. The researchers found that outdoor air pollution, mostly by fine particulate matter with a diameter smaller than 2.5 micrometers (PM2.5), leads to 3.3 million premature deaths per year worldwide, predominantly in Asia. The largest impact on premature mortality globally comes from residential energy use such as heating and cooking, prevalent in India and China. In the United States, emissions from traffic and power generation are important. Agricultural emissions make the largest relative contribution to PM2.5 in the eastern United States, Europe, Russia, and East Asia, with the estimate of overall health impact depending on assumptions regarding particle toxicity. ...continue reading "Millions of Deaths Annually Due to Air Pollution?" Published on September 23, 2015 March 29, 2018 Categories cardiovascular health, healthy living, UncategorizedTags air pollution, fine particulate matter (PM2.5), power plants, smog, soot particles, vehicle emissionsLeave a comment on Millions of Deaths Annually Due to Air Pollution? In what is believed to be the largest, most detailed study of its kind in the United States, scientists at NYU Langone Medical Center and elsewhere have confirmed that tiny chemical particles in the air we breathe are linked to an overall increase in risk of death. The researchers say this kind of air pollution involves particles so small they are invisible to the human eye (at less than one ten-thousandth of an inch in diameter, or no more than 2.5 micrometers across). In a report on the findings, published in the journal Environmental Health Perspectives online Sept. 15, the scientists conclude that even minuscule increases in the amount of these particles (by 10 micrograms per cubic meter of air, for example) lead to an overall increased risk of death from all causes by 3 percent -- and roughly a 10 percent increase in risk of death due to heart disease. For nonsmokers, the risk increase rises to 27 percent in cases of death due to respiratory disease. 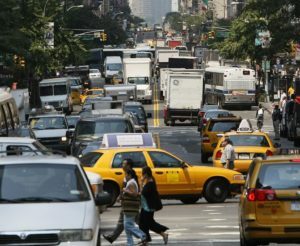 "Our data add to a growing body of evidence that particulate matter is really harmful to health, increasing overall mortality, mostly deaths from cardiovascular disease, as well as deaths from respiratory disease in nonsmokers," says lead study investigator and health epidemiologist George Thurston, ScD, a professor of population health and environmental medicine at NYU Langone. "Our study is particularly notable because all the data used in our analysis comes from government- and independently held sources." According to Thurston, fine particles can contribute to the development of potentially fatal heart and lung diseases because they slip past the body's defenses and can be absorbed deep into the lungs and bloodstream. They are not sneezed or coughed out the way larger natural particles, like airborne soil and sand, are removed from the body's airways. Moreover, Thurston says, fine particles are usually made of harmful chemicals such as arsenic, selenium, and mercury, and can also transport gaseous pollutants, including sulfur and nitrogen oxides, with them into the lungs. Indeed, the team did not find any significant difference in the effect of particulate matter exposure between different sexes or age groups or by level of education. The researchers also noted that limiting the analysis to only the state of California, which has the most rigorous controls on air pollution, did not produce a different overall level of risk; instead, they found the same association between particulate matter exposure and increase in risk of death from all nonaccidental causes and from cardiovascular disease. Exposure to air pollution may have a negative impact on how the brain’s white matter ages. Older women who lived in geographic locations with higher levels of fine particulate matter in ambient air had significantly smaller white matter volumes across a wide range of brain areas, new research shows. The study found that older women ages 71 to 89 who had lived in places with greater PM2.5 exposures had significantly smaller volumes of white matter and that this could not be explained by the geographic region where they lived, their race or ethnic background, socioeconomic status, lifestyle, or medical conditions that may also influence brain volumes. The researchers performed brain magnetic resonance imaging scans of 1,403 women who are part of the Women’s Health Initiative Memory Study (WHIMS), a nationwide report based at Wake Forest Baptist Medical Center in Winston-Salem, NC. The researchers also used residential histories and air monitoring data to estimate the participants’ exposure to air pollution in the previous six to seven years.